Ford Scholar Alumni across the state and even the nation volunteered in their communities during the annual Martin Luther King Jr. Weekend of Service – a day on, not a day off. Ford Scholar Alumni Association Member at Large Marshall Curry believes more alumni can participate in community service projects when there are several events happening across the state. He has taken it upon himself to plan FSAA service projects around MLK Weekend of Service and Earth Day in order to make it easier for alumni to serve their communities. He recruited FSAA members to join events in their communities and invite nearby alumni and Scholars to join them. Four coordinators planned five events in Oregon. Six Scholars and seven Ford Family Scholarship Office staff members had a blast spending the afternoon of Jan. 21 cutting and preparing food at FOOD for Lane County in Eugene. Events were also available for alumni to attend individually in Portland and Central Oregon, and some alumni reported volunteering on their own. One alumnus picked up litter in his neighborhood. Another cleaned a cemetery. Curry invited Salem-area Ford Scholars and alumni to pitch in at the Marion-Polk Food Share, where they formatted recipes, packed food and prepared gardens on Jan. 18. College students from nearby universities attended, however no Ford Scholars participated. Curry also invited alumni to join him for the Willamette University MLK Stride Toward Freedom 5K on Jan. 23. He and FSAA Member at Large Adam Martin helped execute the event. The event organizer said he hopes to see the Ford Scholars and alumni visibly making an impact all over the country wherever they are and asks them to post photos on Facebook, Twitter and send him emails. “That way, I’ll know Kenneth Ford’s legacy is being carried out,” Curry said. 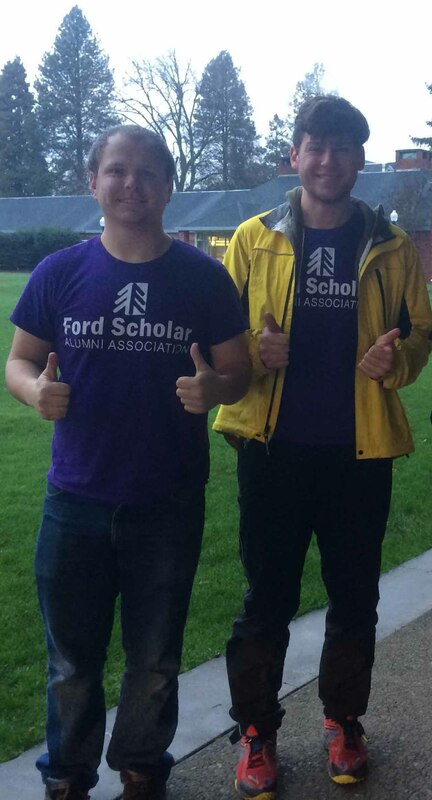 If you are interested in participating in or organizing an Earth Day of service in April, email communications@fordscholaralumni.com.